Like so many writers, I am making my way to Seattle for the 2014 AWP Conference, where I'll be taking part in Thursday night reading for The Incredible Sestina Anthology and sitting in on a Friday noon panel "Verses Versus Verses," on poetry contests. I'd love to see you at either event, or on the book fair floor, or at one of these seafood restaurants, or over one of the cocktails described on Leslie Pietrzyk's blog. If your dance card is already filled and we don't see each other, just have a good time per the advice of Kelli Russell Agodon, hydrate and navigate per the wise words of Roxane Gay, and treat your hotel staff right. It's been fun seeing everyone report what they're doing, on Facebook and elsewhere, but there hasn't been enough attention to those plans where we're simply excited to be in the audience. This year's official event schedule has some pleasing variances--discussion of writing for YA and children's audiences, the graphic novel or comic as literary work, and a spotlight on Pacific Northwest literature, including indigenous voices and Hawaiian writers. Check 'em out. Panels on the influence of Kurt Cobain and Bob Dylan? Yes. In venturing to off sites, be sure to support Elliott Bay Book Company and the Richard Hugo House; since the latter is closed on Sunday, my free day to explore, I'm going to try and make it by for the VIDA reading on Friday night. I've only been to Seattle once before, when I was in my mid-twenties and working for a nonprofit that held its annual conference there. One of my jobs was to coordinate a set of awards that had been received by, among others for that year, Robert Pinsky. I'd studied The Sounds of Poetry. He was a former Poet Laureate. 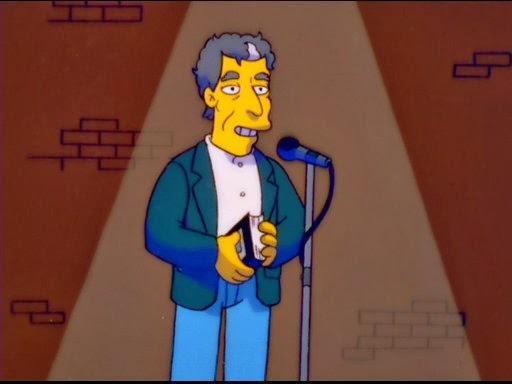 He'd been a voice on The Simpsons, for goodness's sake! What greater fame is there? I was so excited to meet him. About a half-hour before events were supposed to start, my hotel room phone rang, and I learned my father--on the other side of the country--was hospitalized with a collapsed lung, larger cause to be determined. So. I arrived late to the proceedings; as the only poet on staff, I was the only one qualified to spot Mr. Pinsky, who had wandered the crowd, unrecognized and sans name tag or welcoming glass of wine; when I finally got to him, I had nothing better to attach his name tag than a loose paper clip from my purse; the envelope I gave him had the wrong check, made out to one of the other award recipients; I gave him a book to sign--his translation of The Inferno--forgetting I had gotten the copy from a poetry teacher past when he cleaned out his university office. That led to the awkward question "Why is [X]'s name inscribed in my book?" That next morning, right back to work at 8 AM. That night, I ventured to Pioneer Square to distract myself. He played bass. My last morning in town, I went to Pike Place Market and spent $50 on a huge bouquet, the most I had ever spent for flowers: all of my remaining cash I'd saved for the trip. For my dad. I flew the six hours back to DC with them balanced on my lap. Not going to Seattle this week? Not a big deal. AWP is a wonderful resource, but an annual professional conference is not the end-all. (The proof is that Tayari Jones is skipping it, and has been for a few years running.) I do recommend is soul-baring trips in your life, 4-5 days when you're pushed to some type of limit, times when the knife scrapes to the bone of ego and you ask--Wait, what? And when the world does not wait: What am I doing? Why am I doing it? That is AWP, for some. But a square is a rhomboid; a rhomboid is not a square. Whatever excursion defines you, tests you, and liberates you, is a lot more important than the abstract of AWP ever could be. Last night, as the snow fell and kept falling here, I read in the Washington Post that Pandora has died. 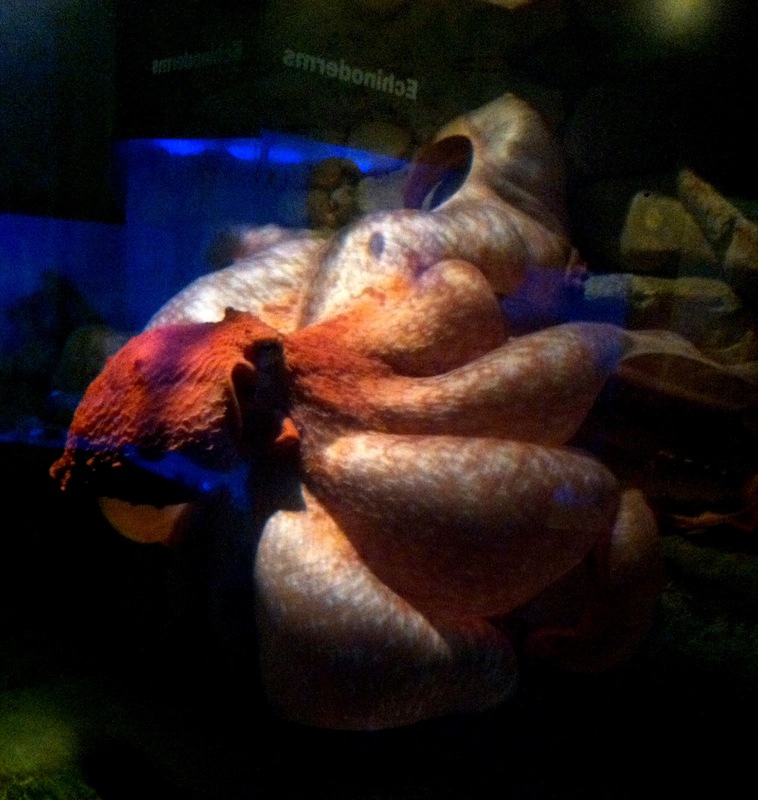 She was a matriarch of our National Zoo's invertebrate exhibits, all 15 pounds of her, all 7.8-foot arm span. 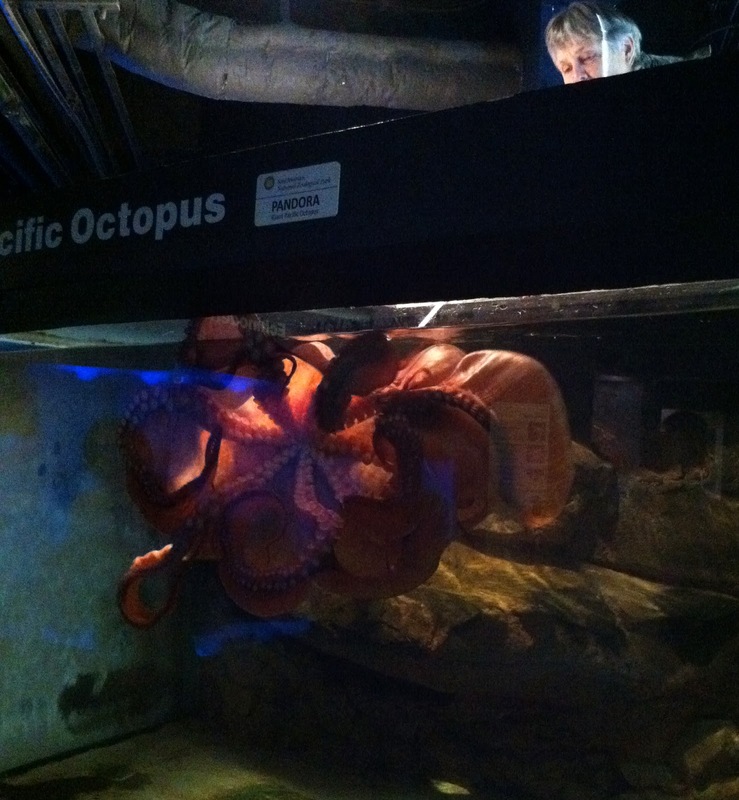 Her death was not unexpected--she'd been sluggish and, at five years old, was approaching old age for an octopus. But she'll be missed. Her rosy pink hue and outgoing manner charmed everyone. Including me, who went to watch her feed on a chilly Thursday in November 2012. That was an unusual detour from my usual stops to the aviary and the cheetah enclosure. It was exactly a week after Thanksgiving, my first week of being engaged. No ring. We hadn't told anyone yet. It was our secret. I stood with my hands jammed into the pockets of my black shearling coat, not sure what to expect. The keeper speared a bit of scallop meat on a long wire and dangled it in the water, wiggling it to make it lively. Pandora approached. Once she was confident of her prey, she began to waft the loose folds of skin between each tentacle, billowing her body wider and wider. As her skin stretched, it whitened, and the bait disappeared from sight. If it had been a crab or fish, it would have had no hope of escape. It was utter. 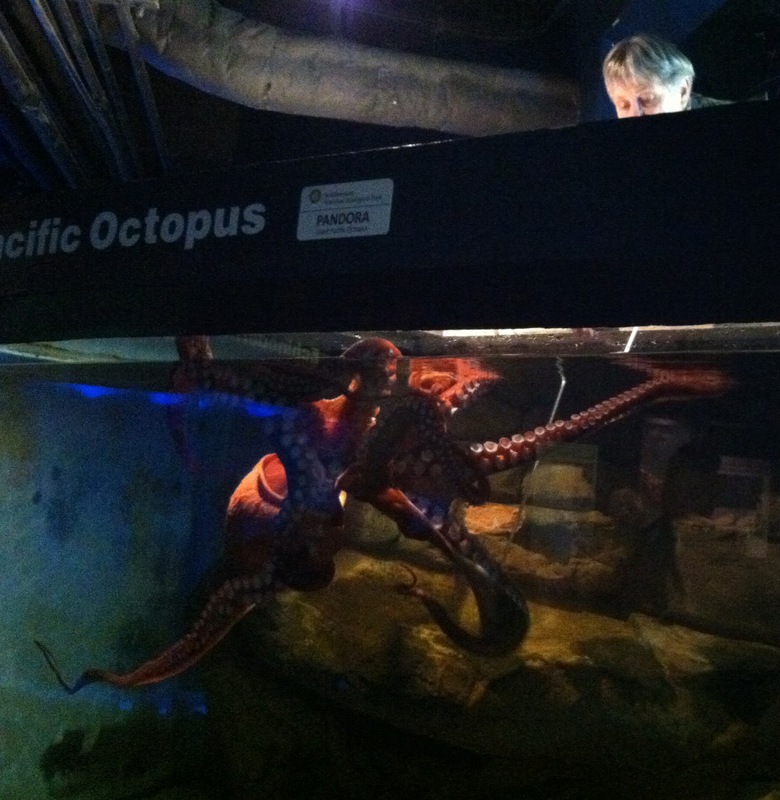 And then she returned to her leisure, sprawling out to eye us, showing off the 250+ tentacles on each arm. 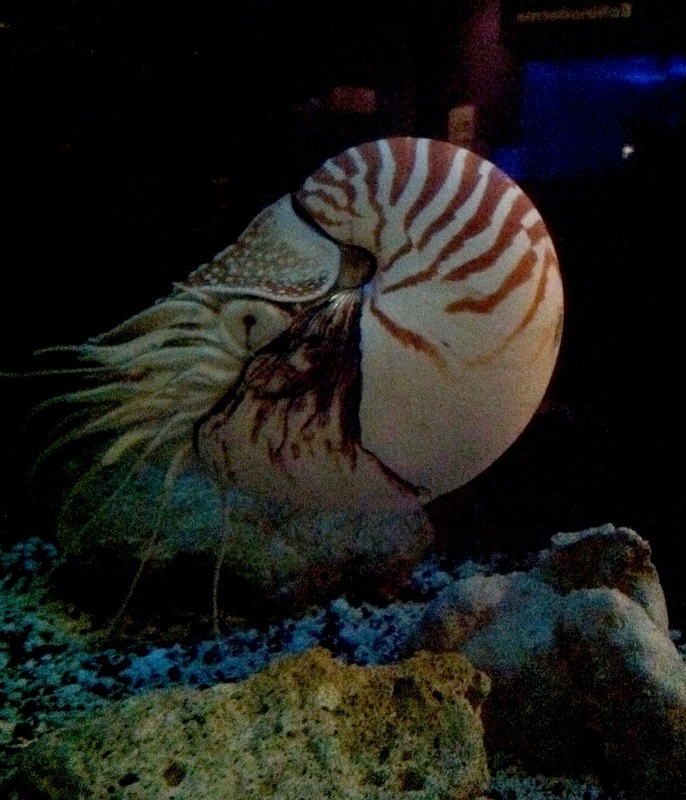 Some years back, I wrote a poem called "In the Deep," inspired by a trip to the National Aquarium--a dank, grim, undernourished and underground box of sad-looking sea creatures--down on 14th Street. 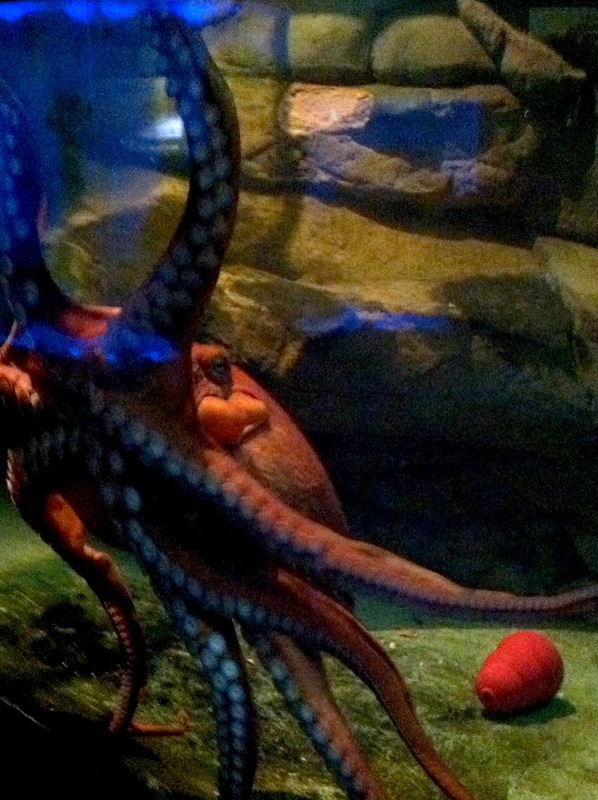 I had recently read an article on giant octopi that talked about their intelligence, their skill as escape artists. At the aquarium, I eavesdropped on some raucous kids, bored on a Saturday, looking for anything worthy of their attention. "In the Deep" appeared first in Hayden's Ferry Review, then in I Was the Jukebox. its bubble of salted air. I'd write a different octopus poem today. That's not to disown "In the Deep," but simply to admit that the heart notices different things at different times. Did you know that a mothering female strings together 20,000 to 100,000 eggs? Once she has laid them, she doesn't eat in the seven months that lead to their hatching. She cleans them, she aerates them, she broods, and shortly after their birth, she dies. Pandora never mated in DC's captivity. 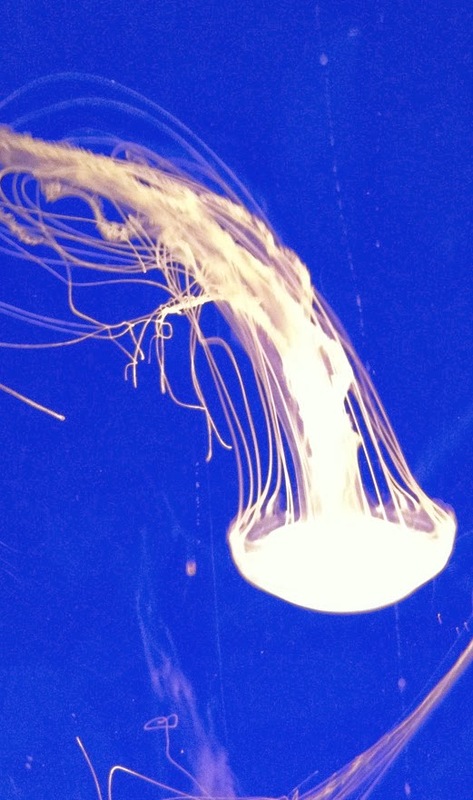 She released her eggs in April 2013, unfertilized. According to the article, each would have been the size of a grain of rice. There is a long tradition of animals being the subject of poems. 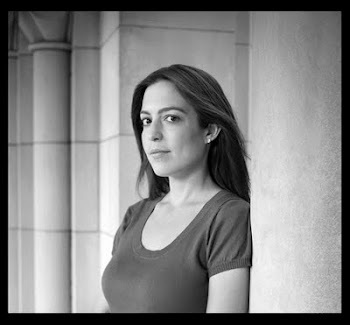 In addition, there is a specific cohort of female poets--poets of my generation--who invoke creatures as tangible actors or omens in their first and second books. I'd argue that we do this at an unusually higher proportion or frequency. I'm thinking of myself, Aimee Nezhukumatathil, Paula Bohince, Traci Brimhall, and Rebecca Hazelton among others. These works are otherwise interested in the psychic interior, works where I'd argue the driving urge is to share something about one's own relationship to the world. (Maybe that's overstating the point, because isn't poetry always about such an urge? Still.) So we point to bright particulars of these beasts as if to guard against the accusation of being self-involved; or, to prove our abilities as biologists and zoologists; or, simply for the pleasure of those particulars. We resist the confessional even as we flirt with it. I recognize this trend without judgment, because even within it there are strong poems and weak poems, variance, individual voices. But I notice it, and I'd love to sleuth out its origins. In the post-confessional morass, is it an issue of agency--do we more easily give ourselves permission to project character onto animals than we would fellow humans? Do humans seem, in fact, a little boring by comparison? Did Disney forever change out perception of an animal's capacity to think, feel, and love? Did Elizabeth Bishop wave her magic wand above our heads? Would we have been another generation's nature writers? No answers here on this quiet day, only questions. 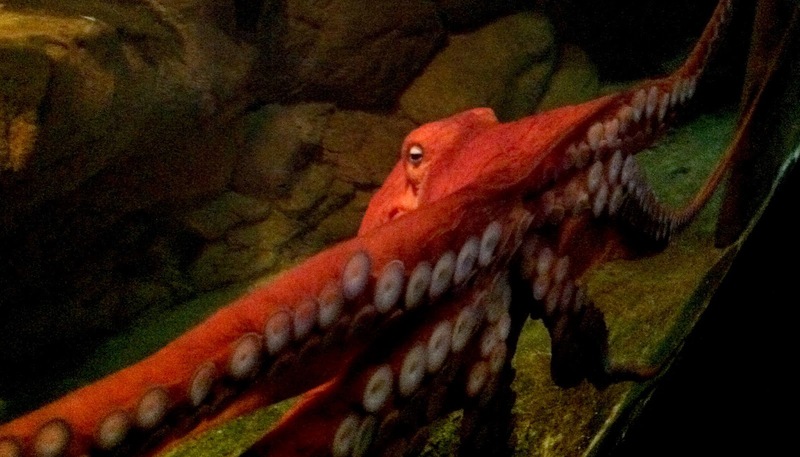 The octopus was a namesake of Earth's first woman, crafted from clay. Pandora was endowed by the gods with all the gifts--beauty, cunning, mastery of music and art, and as a curse, curiosity. Despite her husband's advice she took the top off the vessel, sent by Zeus, that released the world's plagues and worries. Watching Pandora that feed that day at the zoo, I pictured what it would look like if a woman tried to catch all those ills, to swallow them back inside herself. She'd have to balloon, stretching herself so thin her skin changed color, turning her body into a ladle to scoop through the sea and air. Not that it'd be her job. But she'd try anyway.